Black Friday seems to be creeping while Cyber Monday leaps at the biggest retailer stores. Retailers including Boston Store and Kohl’s may seem to double down and bust doors on Black Friday and Thanksgiving Day, but they are offering so much more on Cyber Monday. With the leftover inventory of the fall season, it means retailers are working hard this holiday season to obtain more sales by offering more discounts and promotions. However, this time round, the push is inclined towards online shopping. Apple on the other hand is reshaping holiday shopping by offering bigger smartphones. The spending on mobile phones appears to overtake tablets for the first time. The bigger screens, shopping apps, and easier payment are luring buyers to shop online. Shoppers are not just staying clear of crowded stores during Black Friday, as well as Thanksgiving Day, but preferring to shop online. Shoppers are also putting aside their tablets and instead opting to push the buy buttons that conveniently come with the bigger smartphones like the iPhone 6 Plus. According to International Business Machines Corp, online spending via mobile phones has increased more than 75 percent thus surpassing purchases done via tablet, and for the first time during the Thanksgiving weekends. The reason behind such a shift in buying behavior may be attributed to the bigger screens and easier payment options coupled with the revamp in retailer websites as well as customized shopping apps for mobile phones. It is pretty a big change in consumer behavior as pointed out by the IBM’s marketing cloud director, Jay Henderson. Retailers are making strides to ensure shoppers have an easy time shopping online using their smartphones. On top of that, the device manufacturers are creating bigger screens allowing customers to feel comfortable when they shop online. During Cyber Monday, smartphones accounted for close to 17.1 percent of the spending as of 3 p.m. New York Time when compared to 11.1 percent of purchases done via tablets, according to data provided by IBM. Looking at the figures for last year, spending through smartphones topped 10.5 percent of entire online sales in relation to 12.5 percent recorded on tablets. Forrester Research has hinted that the increased traffic coming from iPhones compared to other devices may be due to the innovations, which have been modeled out in these devices. A lot of it has to do with iPhone’s device improvement considering that tablets haven’t seen such advancement in innovation. The shift in mobile shopping through devices has come in a time when consumers are abandoning stores and considering doing their shopping online. Over the four-day weekend, which kicked off on Thursday, Thanksgiving Day, through to Black Friday, more than 103 million shoppers did their shopping online, according to the National Retail Federation’s annual survey. This figure is higher compared to 102 million people who shopped physically in traditional stores. They year 2015 witnessed a dipping crowd at malls and stores. It was all calm over Black Friday and Thanksgiving as many people opted to stay at home and wait for the Cyber Monday online deals. This shows how quickly and deeply the shopping habits of Americans have changed. Retailers offered promotions online even before the items were available in stores, something that allowed shoppers to relish the joy of having to grab a deal right at the comfort of their couch. At the same time, shopping rituals during Thanksgiving seem to be losing a grip as retailers try to blend into a longer holiday season. Retailers have opted to give shoppers an extended period of discounted products rather than just focusing on a one-day treat. This means that the low prices on products would be spread out through the shopping season that starts before Halloween pushing until hours just before Christmas. The industry is recording an evolutionary change in both retailers and consumers during the holiday shopping. However, it may be difficult to tell if consumers are going to spend more. The change in consumer behavior may not tell exactly if there will be increased sales. The number of shoppers doing their shopping online may surge, but what about their spending. The increasing use of mobile devices may continue to see increased purchases. However, there may be other factors that determine what consumers are willing to part with during their shopping adventure. Online and offline shopping provides different experiences. When shoppers visit stores, they are more likely to be lured to spend more than when they shop online. Did you know that touching a product could make you want to buy it? This is a trick that retailers use to make you dig deeper into your pocket. Also, a perfect or actual scent may lure you to spend more. Senses tend to bypass people’s conscious minds. While many people work on a budget, taking a trip to a store may cause them to part with more money as they are likely to pick a few items they consider to add value to their shopping. 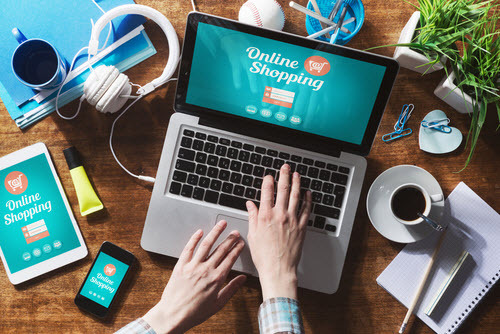 In online shopping, the shoppers may be more specific and cautious on what they are purchasing; however, retailers are also becoming smarter and finding ways to influence shoppers to buy more online. The visual impact that is created when a shopper walks into a shopping mall or retail shop may not be as luring as what happens in an online shopping experience. Nonetheless, it is expected that retailers are likely to record increased sales and attain their target through online shopping. The declining crowd of shoppers during the Black Friday and Thanksgiving may be taken care of by the increasing online shopping that starts hours before Cyber Monday.